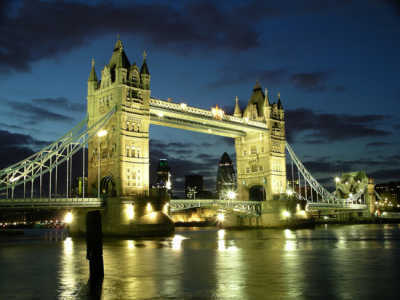 Tower Bridge is the most famous bridge in London over the River Thames. It is close to the Tower of London, which gives it its name. It has become an iconic symbol of London. Sir John Wolfe Barry designed it. The bridge consists of two towers which are tied together.The bridge was officially opened on 30 June 1894 by The Prince of Wales (the future King Edward VII), and his wife. The bridge is 800 feet (244 m) in length with two towers each 213 feet (65 m) high. Thousands of tourists visit Tower Bridge every year. Visit Tower Bridge Exhibition and enjoy stunning views of London from the high level! What is the most famous bridge in London? Why does it give its name? When was it officially opened?